There are countless causes of headaches, but one that is often overlooked is posture. Take a minute to think about how you sit and stand. Now consider how your body feels when you are lying down. Do you experience aches or discomfort around your neck and back? 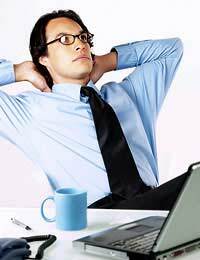 Are there certain positions that seem to cause tension and trigger headaches for you? Poor posture can result in muscle tension within and around the shoulder and neck joints and muscles. It can also exacerbate headache pain stemming from other causes. Some people find that during stressful situations, posture suffers and breathing patterns may become shallow and tensed. For this reason, it can be helpful to focus on correct posture alongside deep breathing. This will allow you to alleviate physical discomfort from a hunched over posture, for example, while also utilising deep breathing exercises to ease the bodily tension that can occur from anxiety and stress. Avoid sitting or standing in one position for prolonged periods of time. Sit up straight and use any cushions or back supports for your lower back as needed. Consider a special headset if you spend a lot of time on the phone. Holding a telephone between your shoulder and head, especially for prolonged periods, can strain muscles and result in sharp tension headaches. Adjust computer screens so that your neck is not strained. When lifting anything, especially if it is quite heavy, lift with your arms and legs, not your back. Breathing is obviously necessary for existence, yet many of us tend to take shallow, laboured breaths. Rarely do most people breathe deeply on a regular basis, but by consciously focusing on breathing and replacing superficial breathing with deeper breaths, you can better oxygenate your body, ease tension and help headache pain. The effects of deep breathing can be quite powerful and it may feel unusual at first, as it is very different from the shallow superficial breathing most people perform. Deep, slower breaths relax the nervous system and provide wonderful physical and emotional benefits for tension, which can really benefit headache pain management. It's also important to learn deep breathing as it assists in releasing tension. Try taking a slow deep breath in to a count of three, and focus on any issues in your life that are stressful and may be triggering headaches and muscle discomfort. Then, release very slowly to another count of three, and imagine your worries dissolving and releasing with your breath. The mind can be a powerful tool when used with deep breathing and may help alleviate headaches triggered by stress.